Sisterhood is Powerful is one of the important books that kickstarted the second wave feminism movement. Robin Morgan edited the book for release in 1970. On the front is the symbol for feminism, also designed by Morgan. This book brought forth large amounts of criticism from men and women alike, but many other women claimed it changed their lives. In this book, Morgan distances herself from prominent feminist organization NOW, which she feared was bringing forth a bourgeois feminism that would not change enough about society. 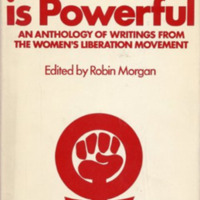 According to her own accounts, Morgan became more radical while editing this book, moving away from the idea of women's liberation as a wing of the movements of the New Left and towards Women's Liberation as a movement of its own. 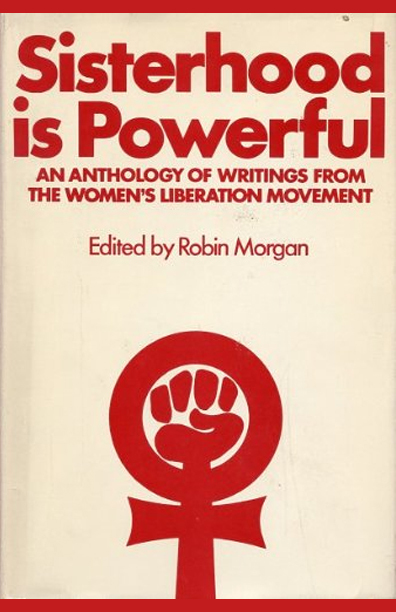 Robin Morgan, “Sisterhood is Powerful,” The American Century, accessed April 20, 2019, https://americancentury.omeka.wlu.edu/items/show/203.